Oh my word, I am in awe. You totally need to do a scrapbooking page on your obsession of one legged socks, LOL !!!! The colours look sooo pretty. I am somehow not surprised (its a compliment) that you are able to knit with a broken arm. Yummo! Looks like a box of candies, but how to choose which one to finish first? Alas, I can now see how easy it is to move on to the next project without getting both socks done first! please, oh please, share your source. It looks like a candy store display. It must be such a delight to pick out which socks to wear when they look so inviting. Thanks for sharing. I love this picture. Thank for sharing the box o' sox. Glad to hear you're getting some knitting done. Sorry it's such slow going, though. Hang in there. This too shall pass. OOOh the socks look perfect like that! I've tagged you, check out my blog to play along! I just noticed that you are going to knit the Thuja... over the holidays I knit the Thuja in different yarns for all my male gifts. It is a quick and fun knit! You will love it. You have also been part of the topic on the Yarnissima thread on Ravelry. New reader here.....and I'm *totally* drooling on your sock stash down lower on the page. This drawer here is quite impressive, too! 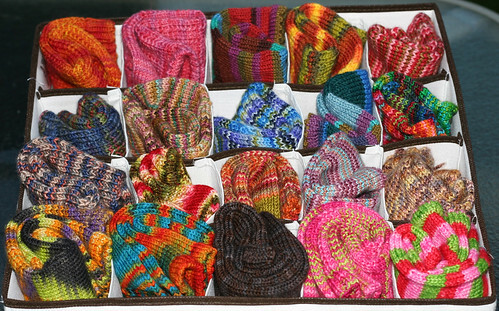 I challenge you to have them all matched up (including the ones on the needles too) by the end of the year! Can ya do it? Oh holy crap... your socks look so damn good. And geez-us your stash is something to be proud/scared of. It's amazing and gorgeous! I've got stash envy for sure. I need to proudly display mine somehow. What a wonderfull picture. :o) The idea with the box and so lovly socks in it! That is a thing of great beauty. I would wear miss-mates. That way you can show off 2 different socks at one time. If you wear a pair you are only showing off 1 of your socks. Go for miss-mates!